Storing pet foods is often a tedious task. You have to take care of the food without being contaminated. Moreover, you got to seal in the freshness and odor so that the kibbles and treats retain their nutritional value. Pests are another trouble that you need to take care while storing pet foods. In addition, the whole mess of spilling the food while taking and filling is another frustrating thing. If you want to put an end to all the above problems then better go for the Bergan Stak-N-Stor Stackable Storage. Bergan’s Stack-N-Stor unit 40 (approximately holds 9 Gallons): This is the smallest size available and Stack-N-Stor 40 can hold up to 27-29 lbs of food. To be precise the dimensions are 15.25″ x 15″ x 12.5″. Convenient for those looking from smaller stacks that consume less space. Bergans Stack-N-Stor unit 65 (18 gallons of dry food): This is the next available size and can hold up to 54-59 lbs of dry food. The dimensions are 15.25″ x 17.75″ x 18.2″. Bergan stack-n-stor 100 stackable storage ( 24 gallons): This Bergan’s Stack-N-Stor unit of 24 Gallons is the largest size available in this brand. Stack-N-Stor 100 can handle up to 72-79 lbs of food easily and has a dimension of 15.25″ x 20.75″ x 20.5″. Bergan’s Stack-N-Stor units are a great addition for all your storing and organizing needs. This multi-use stackable container helps you to organize pet food in an optimal way. This container is not only for pet food, but you can also arrange and use for automotive accessories, garden, hobbies, and other related works. Made of high-density polyethylene, this rust and dent proof container is highly durable. It is suitable for both indoor and outdoor use. Talking about the design and look, it has a dual toned color. Now you can buy larger bags of kibbles, dog treats, and other dry foods and arrange in a proper way. The lid keeps the odors inside the storage unit and retains the freshness of the food. 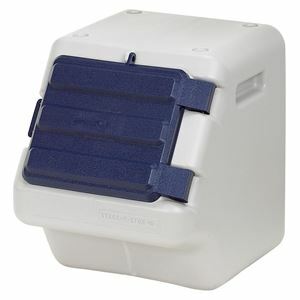 It is a pest proof container and great for outdoor use as it is weatherproof. A single product includes only one stack storage unit. You can buy more and different sizes according to your needs. The best part is that all the three sizes can be stacked over one another as they fit well. There is kind of mixed reviews about this product. A huge majority say that this product is a great addition if you have less space. These containers go easy and consume less space when stacked above one another. Most of the customers say that it is easy to fill the dry food and take them out without making a mess. There are a few negative reviews such as the quality of the plastic used is not up to the mark. A few customers say that this stack works perfectly when the lid comes at the top side, especially while filling the food. Overall most of the customers opined that this product served their purpose. Most of the reviews say that this product is a “great kibble storage unit”. These stacking storage containers can meet all your storing and organizing needs. They have an attractive design and you can stack them one above the other with great ease. Talking about the price, they have a reasonable price. Storing has never been easy before but now it is with these new Bergan Stack-N-Stor stacking containers. If you are looking for a functional and durable stacking system then this product is highly recommended.